Happy October, everybody! And because it’s that time of the year when everyone is getting into the Halloween spirit, I’ll be focusing on Halloween-themed movies this month for Sunday Bloody Sunday. 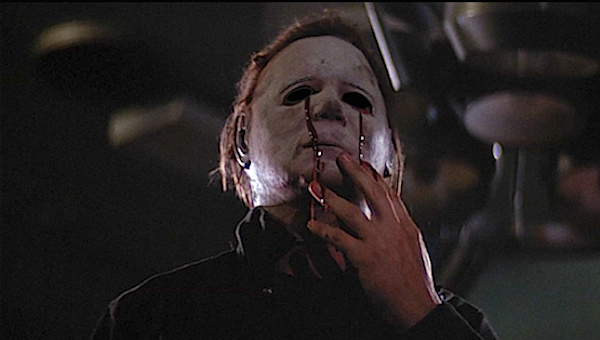 First up, one of my favorite kill scenes from the Halloween franchise. Is it bloody? Nope. It’s all about the subtlety of it all. In 1981’s personally loved sequel, Halloween II, Nurse Franco (Tawny Moyer) goes running after Laurie (Jamie Lee Curtis) down the hospital hallway. Oops though, she didn’t know Michael Myers was looking to have fun with his scalpel! Well, it doesn’t end well for Nurse Franco, and the shot of her being raised off of the ground by Michael and his sharp shiny instrument of death is eerily breathtaking.